NETWORK FINALS: EMPIRE gained 0.1 in final numbers, while RIVERDALE lost the same. CABLE HIGHLIGHTS: Note–due to Thanksgiving Eve last week, comparisons are to 2 weeks ago unless otherwise noted. ESPN’s COLLEGE BASKETBALL doubleheader was at 0.55 (North Carolina vs. Michigan) and 0.26 (Virginia vs. Maryland). VH1’s BLACK INK CREW was up 0.05 to 0.51. Comedy Central’s SOUTH PARK was steady at 0.50. History’s VIKINGS returned at 0.47, down a tenth from the 2017 premiere, and the preceding clip show was at 0.33, also down a tenth from 2017. On Bravo, REAL HOUSEWIVES OF NEW JERSEY gained 0.07 from last week to 0.43, and REAL HOUSEWIVES OF DALLAS was up 0.05 to 0.26. 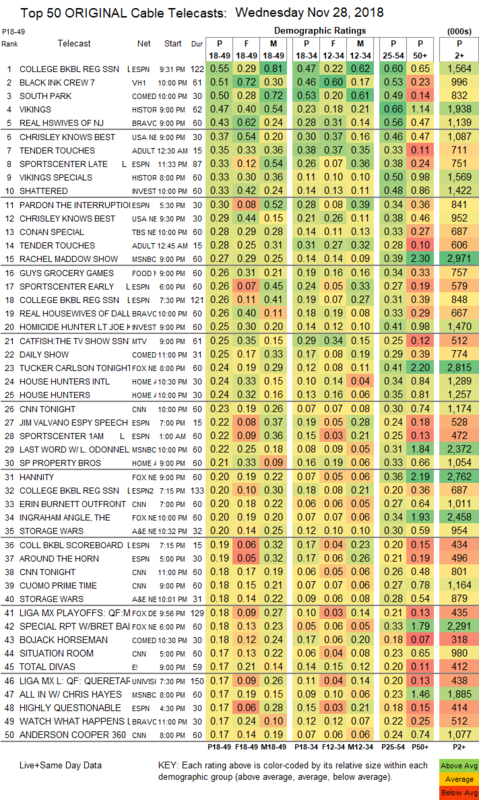 On USA, special episodes of CHRISLEY KNOWS BEST were at 0.37/0.29, and a special REAL COUNTRY was at 0.12. Adult Swim’s TENDER TOUCHES was at 0.35/0.28. On ID, SHATTERED rose 0.07 from last week to 0.33, and HOMICIDE HUNTER was down 0.07 from 2 weeks ago to 0.25. TBS’s primetime CONAN special was at 0.28. MSNBC’s RACHEL MADDOW SHOW led cable news at 0.27/0.39/3M, with Fox News’s TUCKER CARLSON TONIGHT at 0.24/0.41/2.8M, and CNN TONIGHT at 0.23/0.30/1.2M. Food Network’s GUY’S GROCERY GAMES gained 0.03 to 0.26. MTV’s CATFISH was at 0.25. 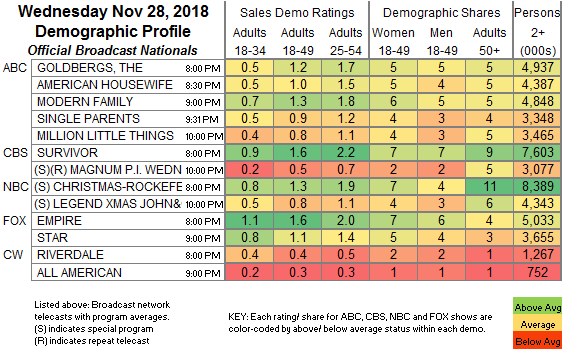 On HGTV, HOUSE HUNTERS INTL slipped 0.02 from last week to 0.24, HOUSE HUNTERS ticked down to 0.24, and PROPERTY BROTHERS was down 0.03 to 0.21. A&E’s STORAGE WARS was at 0.20/0.18, compared to last week’s 0.17/0.16. E!’s TOTAL DIVAS dropped 0.04 to 0.17.